Online marketing that engages, informs, instructs, entertains, celebrates and entices.... rising far above typical boring online presentations. Daniel Design Group is uniquely qualified to provide you the best in online marketing. Years of marketing experience - combined with professional web design, web photography, web animation, web audio and web video - gives your visitors an exceptional online experience and you an exceptional advantage. It's no longer the wave of the future... it's NOW! Rich Media is the most effective way to captivate your visitors and get your message across. New York City Publicity Company, Theatre Mama contracts Daniel to photograph angels who roam San Diego for two days to promote Cirque du Soleil's new show, "Corteo." Project: Complete new web site featuring the luxury homes of the Zacher communities. Project: Complete new web site; introducing new line of bass boats. Project: Short animated web "commercial"
Phoenix Annual Parade of the Arts - Phoenix mayor, Phil Gordon, posted a link to Daniel's impromptu video of the Phoenix Annual Parade of the Arts from the city's "State of Downtown" web page. Get In Gear 10k (Minneapolis, MN) - selects Daniel to design their new web site. 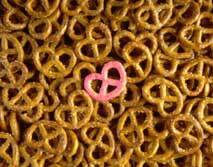 British Council (Belfast, Ireland) - requests Daniel's "pink pretzel" image (above) for their web site. Zizzi Contracting (Long Island, NY) - selects Daniel to design copper letters for the signage of their two new home communities. Hydracraft (Long Beach, CA) - selects Daniel to design their new web site. Hydracraft is a designer of unique changeable hull (consumer and military) boats. Professional Sales Coaching (Phoenix, AZ) selects Daniel to re-design the look and focus of their web site. The Bainey Group (Minneapolis, MN) selects Daniel to re-design the look and appeal of their web site. The Bainey Group is one of Minnesota's 50 fastest growing private companies. They construct, remodel and renovate office, medical, industrial, warehouse, retail, restaurant and government buildings. Twin Cities Black Professional Network (TCBPN) selects Daniel to develop a brand new web site. TCBPN is sponsored by General Mills, Target, Medtronic, Best Buy, and Northwest Airlines. Clearwing Productions (Milwaukee, WI, and Phoenix, AZ) selects Daniel to design, manufacture and install fleet graphics and office reception signage. Clearwing Productions provides professional sound and lighting for a host of major productions around the country.